Apart from being in generally poor shape, notice that the STEAK HOUSE was removed first. 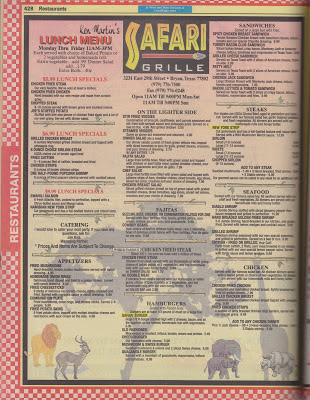 Sometime around 2005 (correct me if I'm wrong, here), Ken Martin's rebranded to "Ken Martin's Safari Grille", which updated and expanded the menu (though, despite the new theme, did not add exotic meats to the menu). 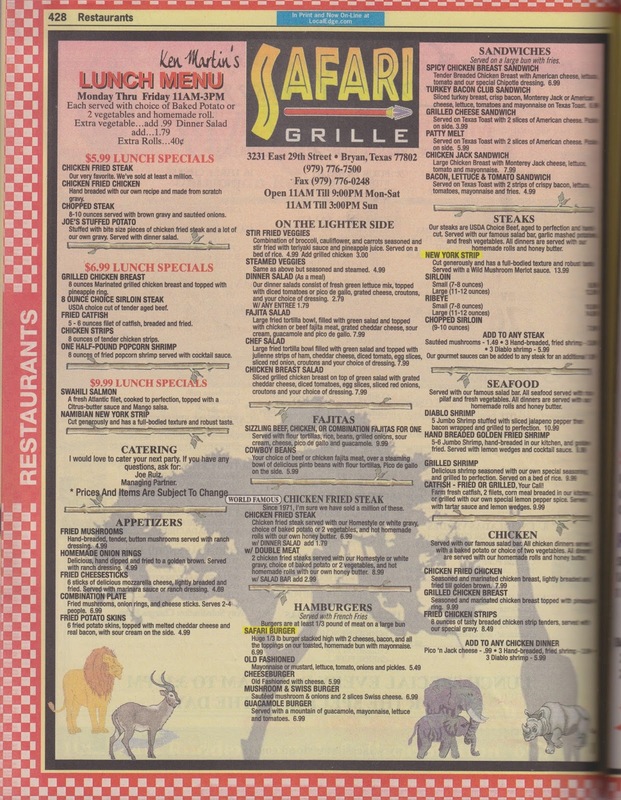 The menu for the Safari Grill is below. 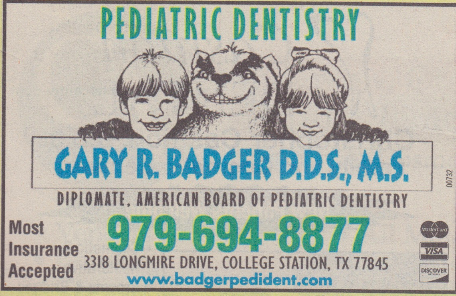 Because I scanned it from a phone book (still very much intact), some of the letters were blurred. That should be "aged to perfection and hand-cut", "garlic mashed potatoes", "texture and robust taste", prices down the line were 9.99, 12.99, 10.99, 14.99, 3.99, 1.99. For the seafood, "served with rice pilaf", "served with our homemade", the Breaded Golden Fried Shrimp is 9.99. For the chicken, "lightly breaded and fried", "topped with pineapple", "served with". Extra shrimp with the chicken is 3.99. In December 2011, after about four decades of serving chicken fried steaks, Ken and his wife retired from the restaurant business and shuttered Ken Martin's forever. Comments are appreciated. Finally, a picture of it in operation, from Project HOLD. Taken circa 2001. 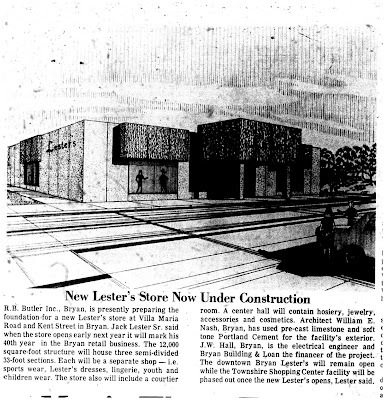 Opening in June 1984 (the ad below is from 1985) as perhaps one of the earliest commercial buildings east of the freeway, Furrow (everyone called it "Furrow's", though) was the main go-to hardware store in the 1990s for me. 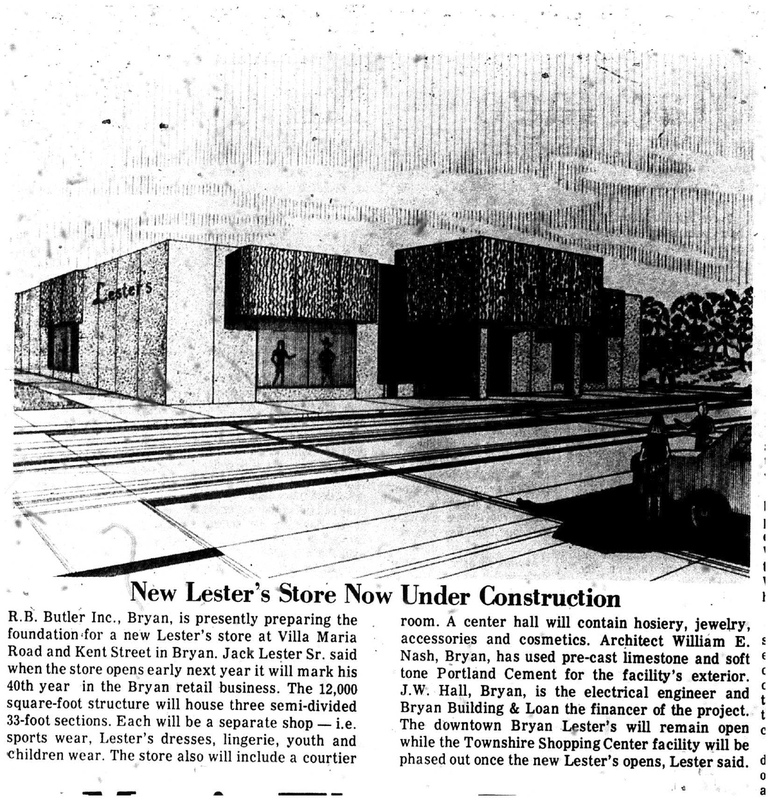 It was the type of store that could be called "your father's hardware store", it was for my dad, and I have fond memories of it, too. 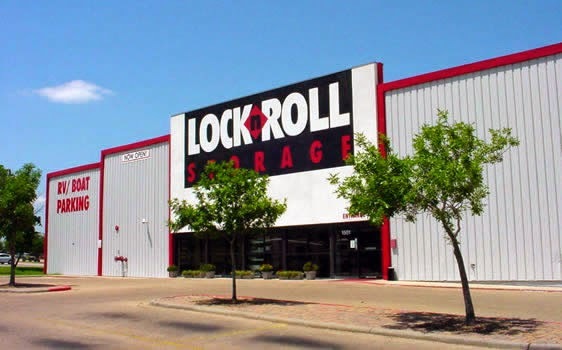 The company went out of business in 2001, and was in the last stores to close. I remember one of my last visits was on September 11, 2001. 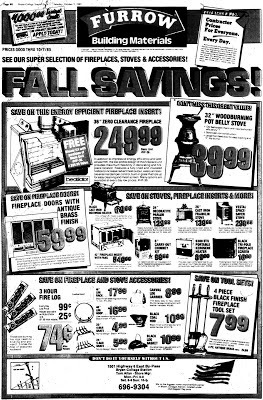 It had tile on the floor and drop ceilings, and was by all definitions a classic hardware store: bulk displays of the basics (like nails) that you could fill your bag and weigh, plumbing equipment, an outdoor lumber yard, and more. To me, this was the distilled version of the "hardware store". It had plumbing, insulation, and other things for DYI work, but didn't have large bathroom displays, no lawnmowers on display, no various household appliances (no smoke detectors if I recall correctly, but may have stocked lightbulbs), no garden center, no flooring. The employees didn't try to upsell overpriced décor for your house, and it was convenient. There were also lots of candy in bags near the front, about a pound of the stuff each, like, say peanut candy. I remember I got something near the end of the store's days and it was really stale, indicating that they hadn't moved merchandise in that section very often. Interestingly, the company name was Payless Cashways, and held a number of different names used in towns. 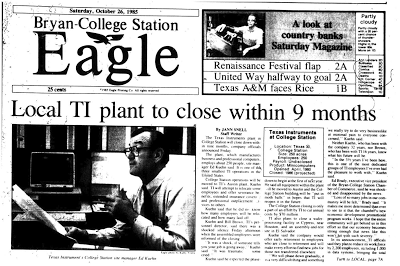 Years later, I would revisit the "small hardware store" scene with Ace of Aggieland, though sadly it just wasn't the same (for reasons detailed there). The University Services Building (not to be confused with the General Services Complex building at TAMU, nor the Special Services Building) is a thoroughly unimpressive warehouse located in a somewhat secluded area, which I know primarily as the place where you can find lots of animals preserved in glass jars (I went there for a field trip in eighth grade...), but at one time, it actually assembled computers for Texas Instruments (back when they made computers), though TI closed the plant after only about six years (1980-1986). This article originally just had a Garcia's ad and from there, the comments started to come in. Taking into account some of those, here's the more complete chronology. 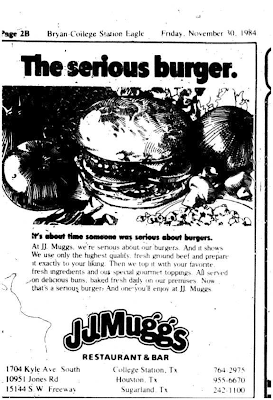 This post was originally simply named "Garcia's" and after more restaurants were added to the post, it was renamed "Burgers to Burgers (From JJ Muggs to Fuddruckers)" in 2014. With recent rumors of Fuddruckers moving out due to the lease ending, even that may be irrelevant. So here goes. 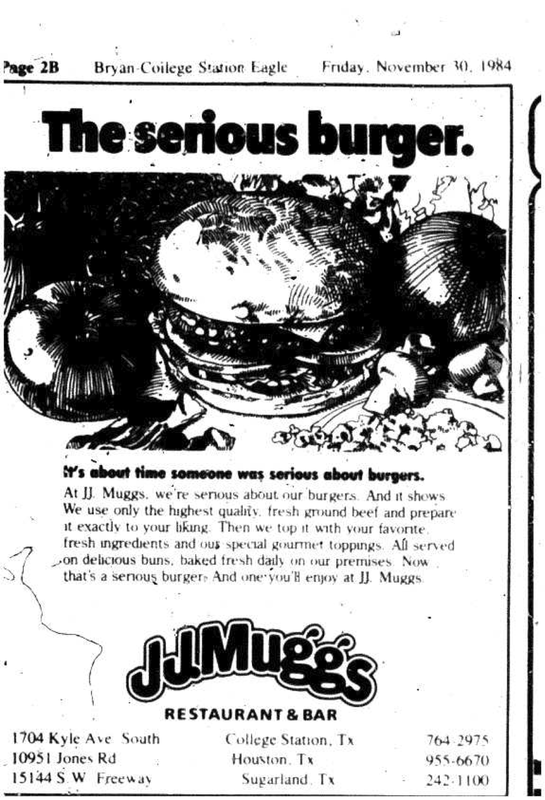 Opening circa 1984, the first restaurant here (keep in mind that this area was much less developed and one of the only restaurants in this stretch) was a hamburger place with a few other locations called J.J. Muggs. It didn't last all that long but was well remembered. 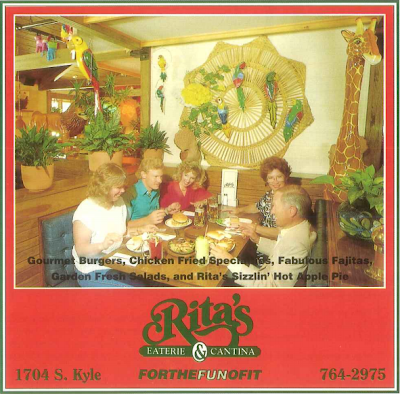 The next place to fill in the spot was Rita's Eaterie and Cantina, which opened sometime in the late 1980s. 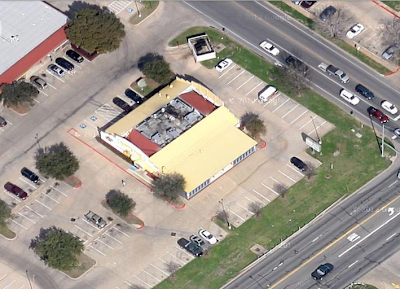 There was another Rita's Eaterie and Cantina in Nacogdoches that has closed within the last few years. I'm sure they were related. 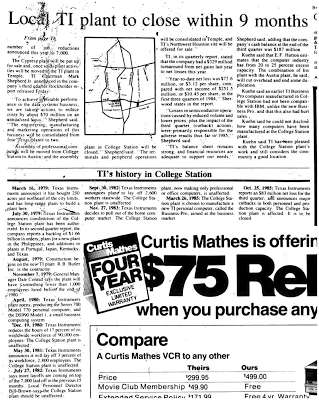 Finally, it became Garcia's, a Tex-Mex restaurant that was open through most of the 1990s. The ad above came from a mid-1990s copy of defunct local magazine "etc." 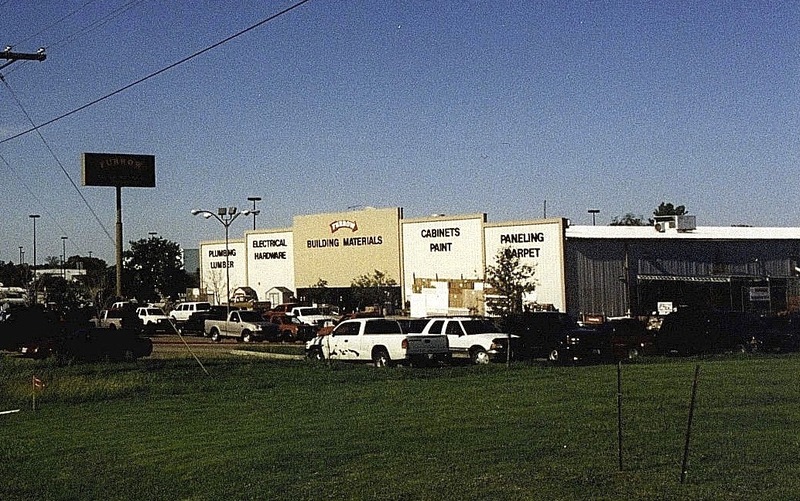 Garcia's closed circa 2003 after being open for years and is still missed in some circles). 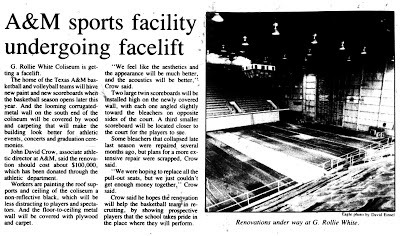 I remember it had some sort of papier-mâché cow head hanging from the ceiling, and as the A/C kept going, the "neck" was blood red. That was my most vivid memory of it (I only went once). Does anyone remember when it opened, officially? Fuddruckers moved in soon after (opening 2004 if my memory is correct) and it's been Fuddruckers next. 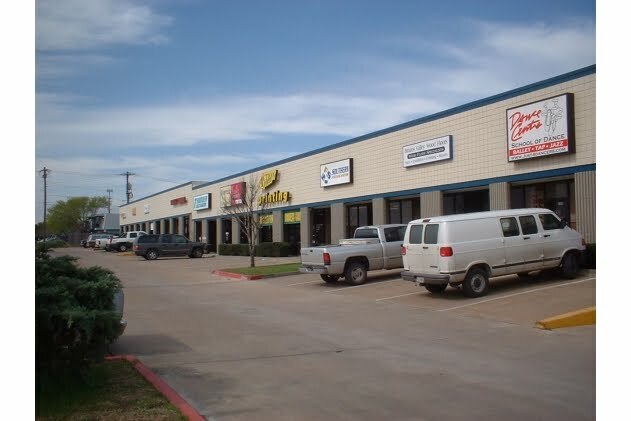 Now, of course, with news that it's moving out (probably to a combined Luby's/Fuddruckers combo store elsewhere), who knows what it will be next? Write in the comments if you know before I do! 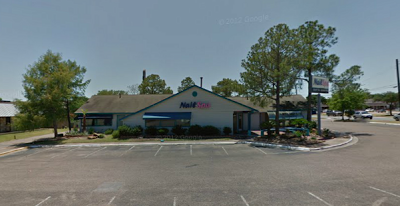 Extensively updated in July 2014 with new restaurants and ads, updated again in 2016. 1971 Phone Book, an image oft "borrowed": this is what prompted me to use watermarks. 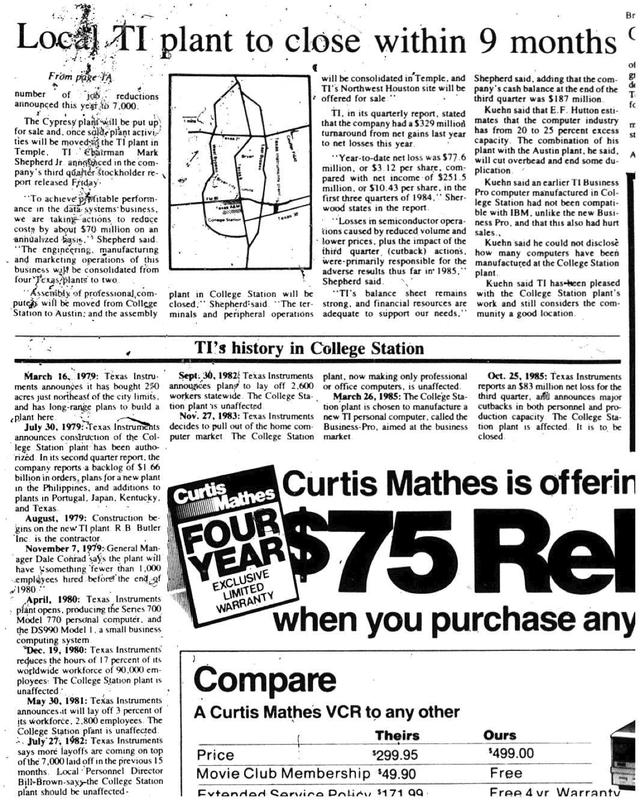 Although now Tobacco & More, a discount cigarette/convenience store, for decades, it was the Texan. 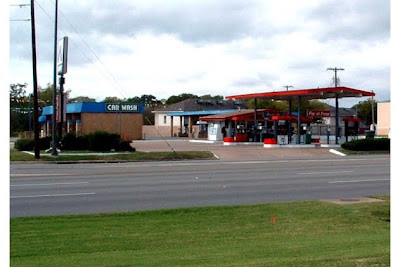 Known for its chef-prepared food and delicious salads (even in a less-than-fancy exterior), the Texan began as a drive-in from the 1950s era drive-in that Robert Tapley and his wife Diana bought in 1967. They slowly worked the greasy spoon short order menu into a fancier experience, and by 1971, we had the gourmet experience shown above. For decades, the Texan entertained and fed a loyal clientele, but the market changed. Robert Tapley passed away in 1992 with Diana taking over as head chef and owner. 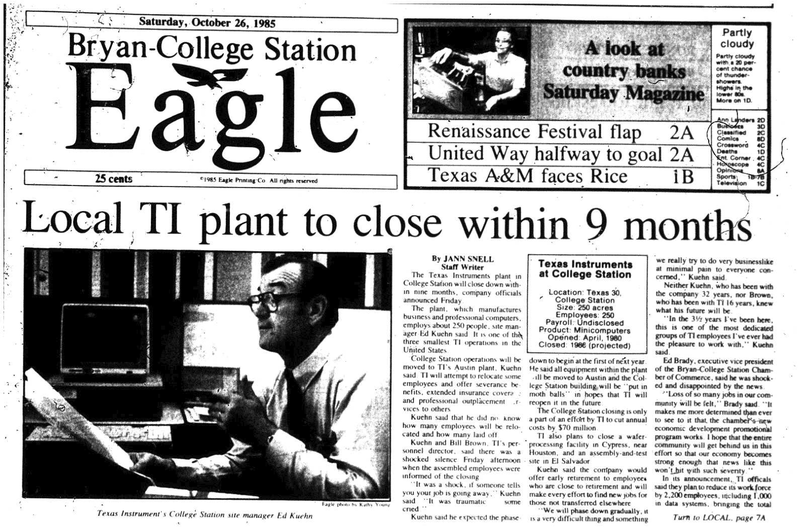 The 1990s brought more limited hours to the restaurant, and new restaurant chains in town began to tear into the crowds. Some changes were made to remain competitive, such as cutting prices and making the salads in the kitchen instead of tableside. The final blow was Christopher's World Grille (opened 1999), which although wasn't trying to kill the Texan, ended up doing in the restaurant. By 2000, they were open only 3 days a week, and Diana, now in her early 70s, saw no other choice but to close the restaurant permanently in May 2000. Notes: InSite Magazine, May 2000 provided some additional information on the end of the restaurant. Updated March 2014. To replace the stock picture that used to be here, here's one from 2015 taken from the Jack in the Box across the street. Originally I posted this back in fall 2011 (based on the wording of the 2011 post), and that was a point when I was still trying to figure out how to make the blog like I wanted it. Even after 2013, it still had much of the 2011 wording in there. 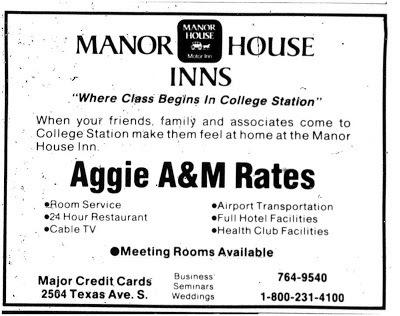 The Holiday Inn Express of College Station is and to my knowledge has always been on University, near Spring Loop. This is not what this post is about. 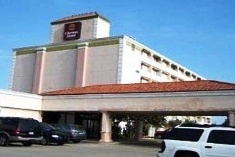 Nor is it about the Bryan Holiday Inn, which somehow managed to get a Travelodge license after operating for years as a no-name motel since the late 1980s. 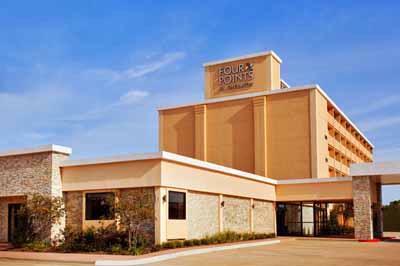 The Travelodge name disappeared soon after a prostitution bust, so it's back to being a no-name motel again. 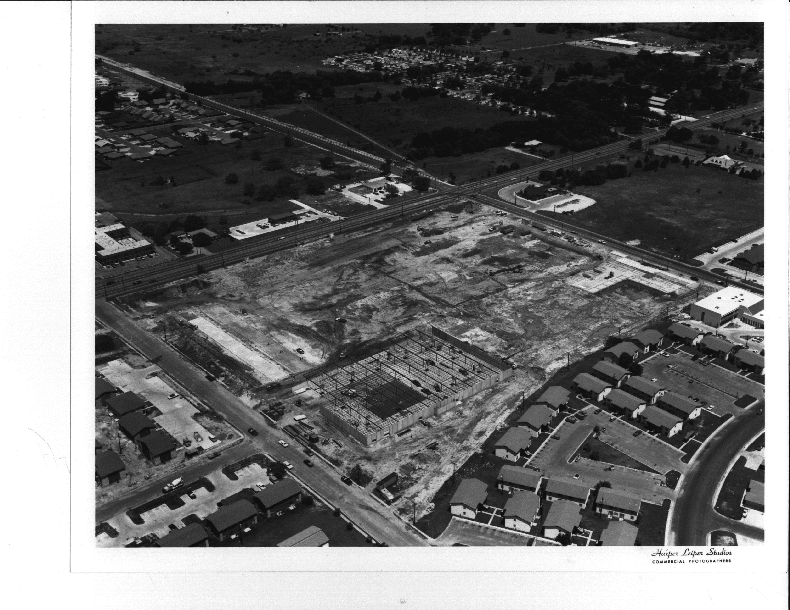 The hotel that is now Four Points by Sheraton was a Holiday Inn, opened circa 1973 (it was under construction in 1972). Why Holiday Inn didn't build new on the highway, as that was their modus operandi, was because even though the bypass did exist at that point, there was nothing on there, and Texas Avenue still was where the activity was (indeed, Earl Rudder Freeway does look a bit barren at some points--compare and contrast Cypress, Texas). 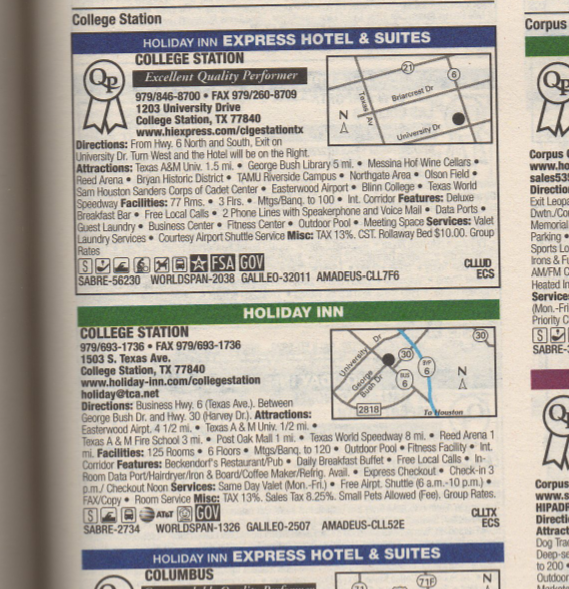 For years, this hotel perplexed me because I seem to remember the Clarion name was on far longer than 2005, but maybe my brain already was getting frazzled by the time because of all the changes. 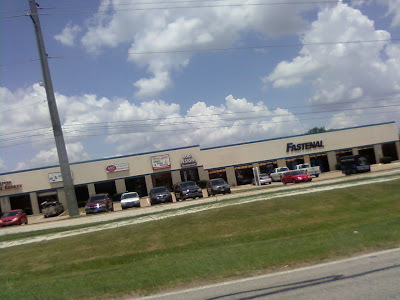 Even Google Earth supports some of the things that I've found. 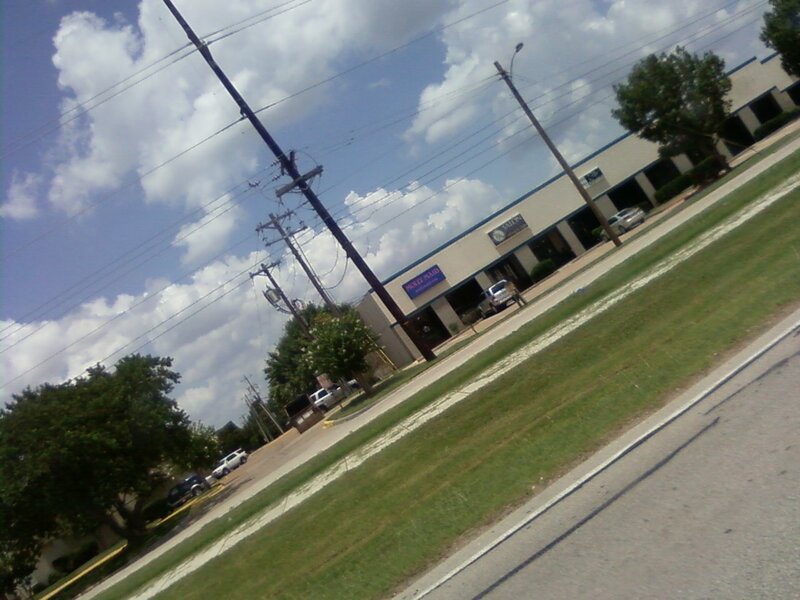 OK, so here we have the two hotels, the one on Texas Avenue and the Express near the University. Makes sense. Fast forward a few years to the 2005 directory, now owned by InterContinental Hotel Group (the "hotel" side of 6C, as 6C broke up). The new Holiday Inn is indeed on Southwest Parkway and the freeway, though by Q3 2005 it was still under construction. By Q3 2006 it had been running for a bit. 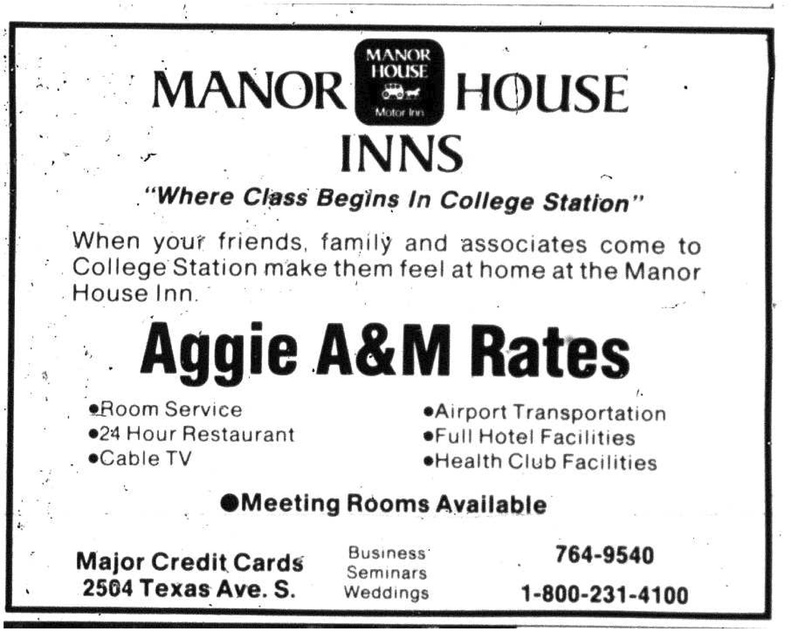 The old Holiday Inn as you may know was the "College Station Inn" for a few years, but it was Clarion for several years before that, seemingly long before Holiday Inn moved out to the highway. This odd memory is supported by the fact that someone perhaps Photoshopped out the logo. Why? Why would they do this? 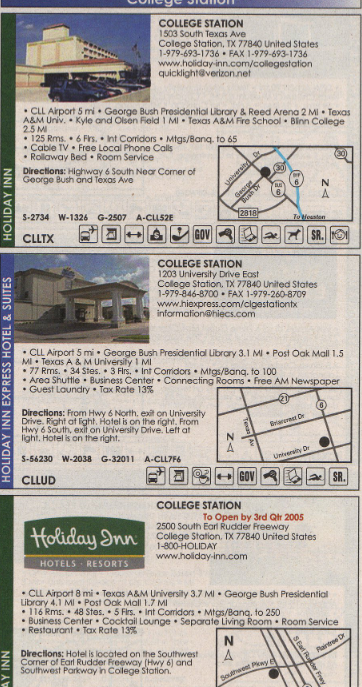 Here's what the Four Points/Holiday Inn looked like as a Clarion (a picture of the "College Station Inn" is unavailable). 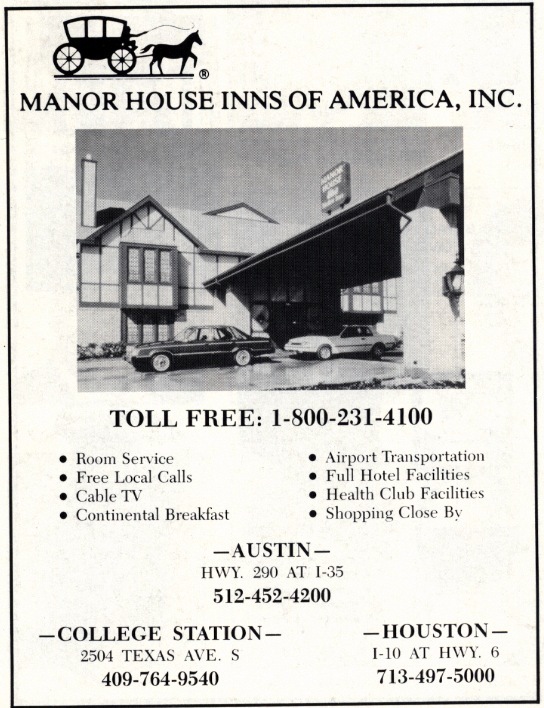 The phone books due line up with the Holiday Inn until 2005 and Clarion later (College Station Inn didn't last all that long, admittedly). Regardless, renovations began in 2011 that all but stripped down the Holiday Inn and in April 2012, Four Seasons by Sheraton opened, which is their mid-line brand. 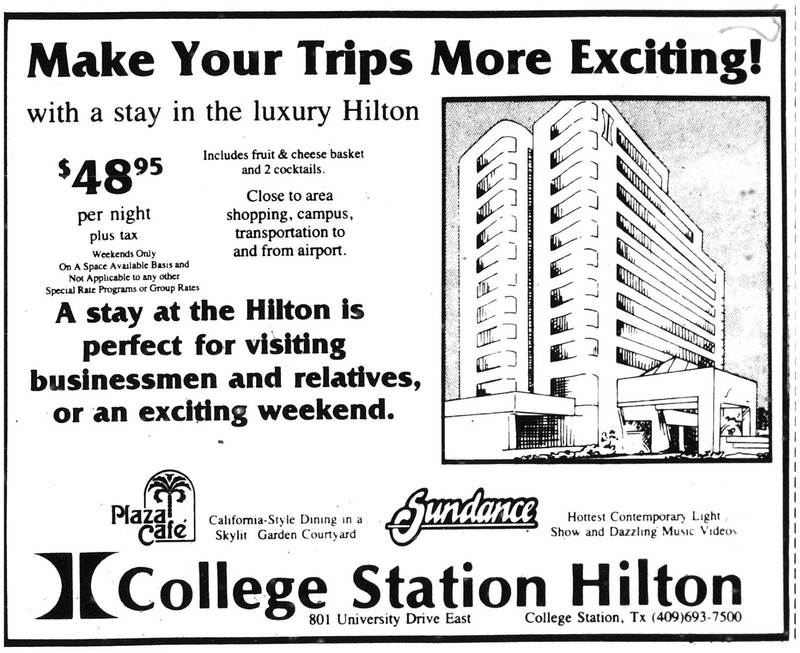 We don't have a full-line Sheraton in town, of course, that's for large cities. From HotelPlanner.com, presumably taken on a hot summer day. 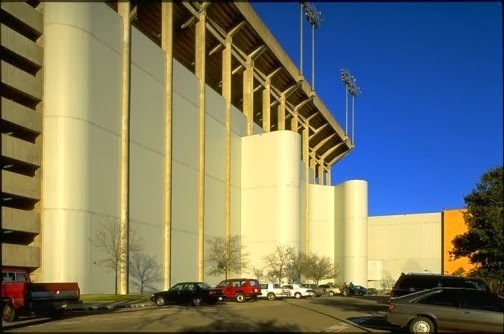 The paint isn't quite orange like that, but it can appear as such during certain times of day in certain parts of the year. Perhaps it would be more interesting if I focused on the restaurants. 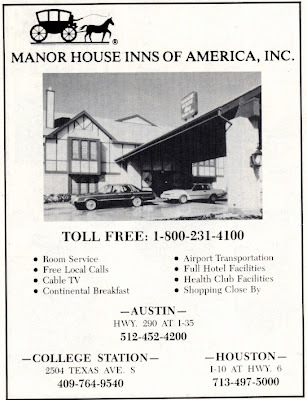 One of the things about Holiday Inn was their restaurants, good enough that it was able to function on its own as a semi-independent component and not just a liability to keep guests in the hotel. The link to Pleasant Family Shopping talks about this in great detail, but to be honest, I think that such a thing is a bygone element now. I ate at a sit-down restaurant in a hotel once without actually staying at the hotel, I had spaghetti. That, however, was in 1998, when I was much younger than however old I am when you are reading this. 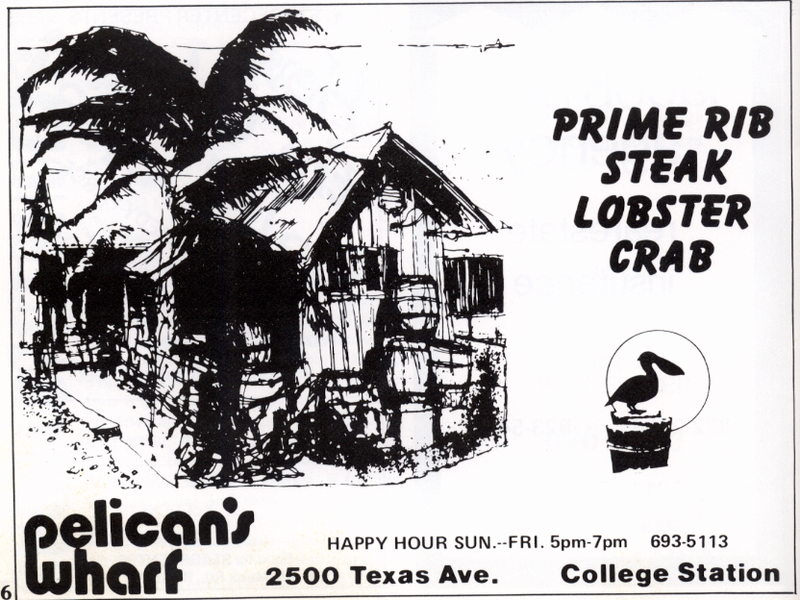 From what I could tell, the early days of the restaurant didn't have a name, the only references came in the paper of what they'd be serving that day (1983 papers seemed to mention only what they'd be serving, Mexican, etc.) 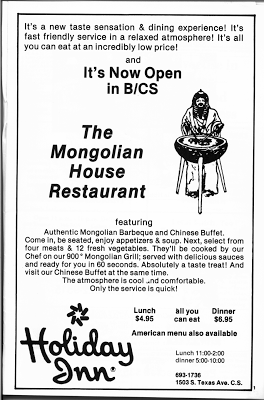 That all changed in 1984, when the restaurant became Mongolian House, a Chinese buffet and Mongolian grill. 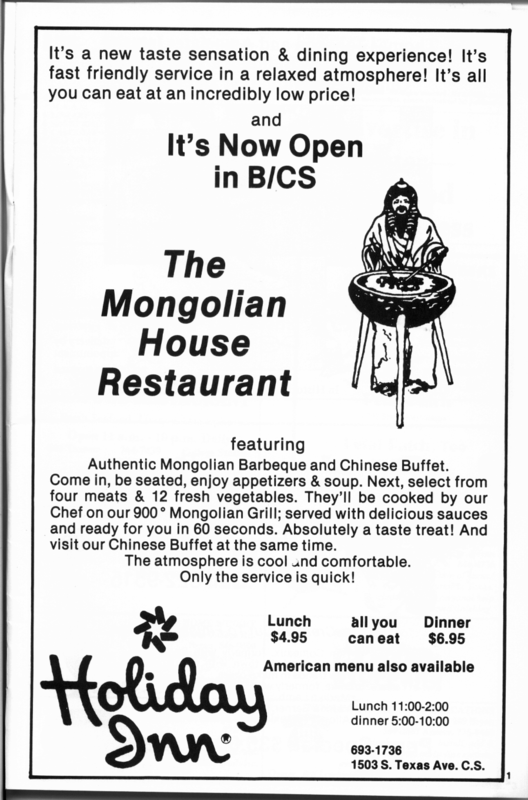 Garfield's was a higher class establishment than the more family-oriented Mongolian House. Open 6 am to 11 pm, Garfield's marketed toward more than the hotel crowd, and offered a menu that included prime rib, steaks, seafood, burgers, and sandwiches, as well as "54 beers of the world", which was rather good considering that craft beer was not the market it was today, and between Garfield's and Mongolian House, there was "Daddy O's" according to a city directory, and by the mid-1990s it was "Bronco's - The Texas Café". Naturally, there are going to be some I missed. 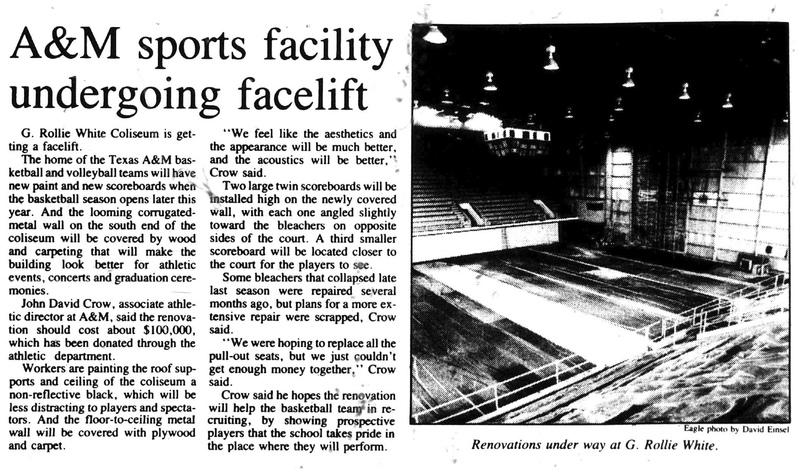 In keeping with this tradition, the current Four Points does in fact have a restaurant and bar. It's not Asian food, it's the "Century Café". It even stocks New Republic beer (brewed locally). This was taken in October 2015, and it was actually a lot darker than this, but the flash wasn't on. 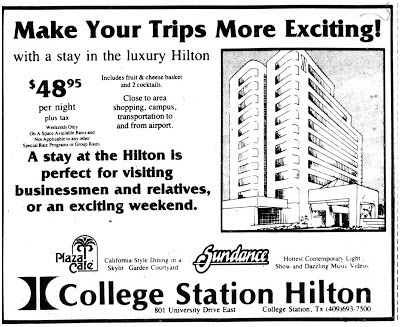 The Hilton opened in May 1985 (confirmed), and unlike the Ramada Inn a few miles down, survives today as a Hilton. Plaza Café became Bell Ranch Steakhouse later. 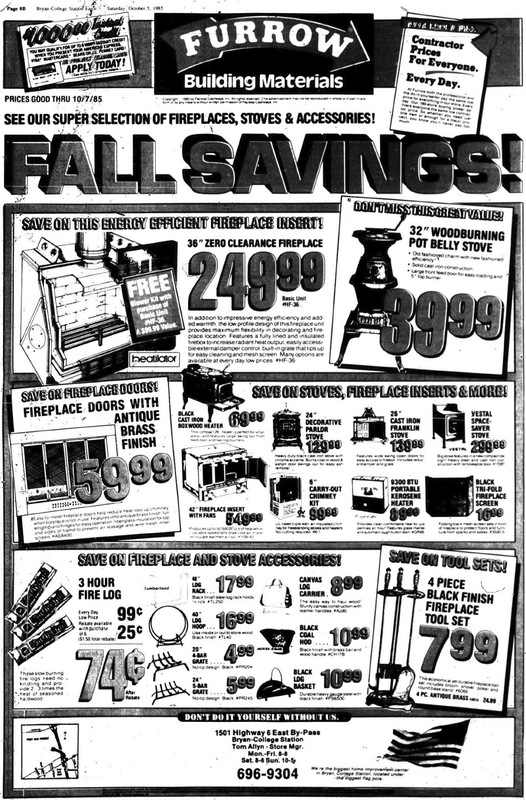 Personally, even accounting for inflation (about $109 today), that sounds great, especially in October 1985 (football weekends). And they include alcohol and a gift basket as well? Not bad, not bad at all! I have no idea what became of Sundance, though. 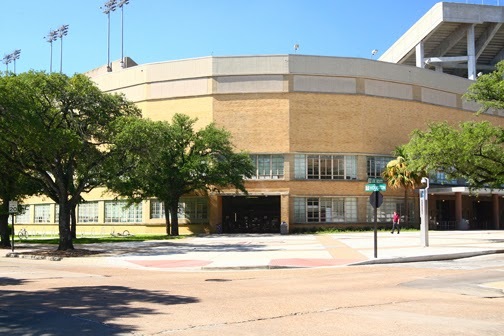 Additional history (renovations, etc.) is always appreciated...though I do believe it renovated at least twice to some extent.